Hunting for deer antler sheds has become a big event in recent years. People hunt for shed antlers for various reasons and some are not even hunters. Some want to find shed deer antlers to make various items …lamps, knives, etc. Others are serious about finding shed antlers for management purposes. Finding shed antlers (especially both sides) allows the you to rough-score the bucks to get a good idea of current and future quality. In addition, finding a particular buck’s antlers can let you know if he’s made it through the winter or if he’s still in the area. Also, finding numerous shed antlers over years on a particular piece of property allows you to gain knowledge regarding the areas that bucks are frequenting. 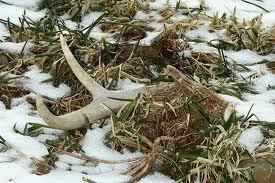 The first thing you will need to do is find land for shed antler hunting. Look for woods or fields that you know bucks frequent. If you don't have family or friends that have land you can use, it usually isn't hard to ask permission from a landowner (since you won't be hunting for animals and won't be carrying any weapons). Once you have found your land, you must know the best time of the year to search. Early Spring is the prime time to hunt for shed antlers. Although you can find sheds year-round, this is the best time, the bucks have usually dropped both antlers by now. Timing is of the greatest importance. Start too early in the season and you’ll find nothing. Starting too late means antlers will either be partially or entirely eaten by small mammals and other rodents or vegetation will be well-grown making antlers even more difficult to find. Look in and around late-season food plots. Examine travel corridors and water sources. Use a game camera to ensure most bucks have shed. Keep an eye out for new hunting locations. When bucks drop their antlers can vary by region and even parts of the state. I recommend keeping an eye on the deer herd or using your game camera to document when bucks are losing their head-gear in your area. Then it’s just a matter of getting out there and putting in some time. Good luck! The first book dedicated entirely to shed hunting. The 160-page book is an in-depth guide that teaches you how to find naturally shed white-tailed deer antlers. Written by Joe Shead, a former managing editor of Deer & Deer Hunting magazine and a passionate shed hunter. Some of the nicest antlers are those found by hunters when a buck sheds them after the deer hunting season. Send us a photo of the shed antlers you have found. Your submission will appear on a Web page exactly the way you enter it here. Do you have some pictures or graphics to add? Great! Click the button and find the photo on your computer. Select it and click on the button to choose it.